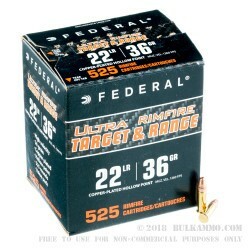 Both new and experienced shooters will enjoy how easy this 22 LR ammo by Federal Ultra is to shoot. 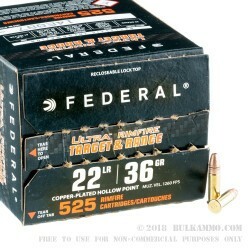 Designed by Federal as an inexpensive range round, these rimfire-primed cartridges are also great for casual shooting and plinking in the backyard. 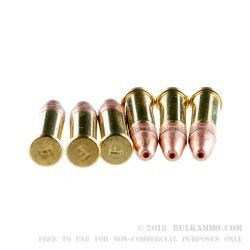 Equipped with a 36gr copper plated hollow point (CPHP) projectile, these rounds are designed to not over-penetrate your intended target due to the wide expansion that occurs. With a modest muzzle velocity of 1250 fps and a matching energy transfer of 125 ft/lbs, the recoil of this 22 LR is basicall non-exsistant, so you can spend hours practicing your marksmanship without feeling a thing! Federal Premium is an American ammo company located in Anoka, MN, and shooters have relied on the quality of their ammunition since 1949. 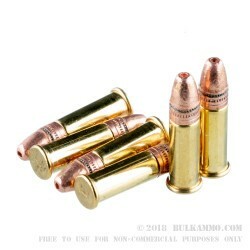 Order your 525-round bulk case of this 22 LR ammo today!